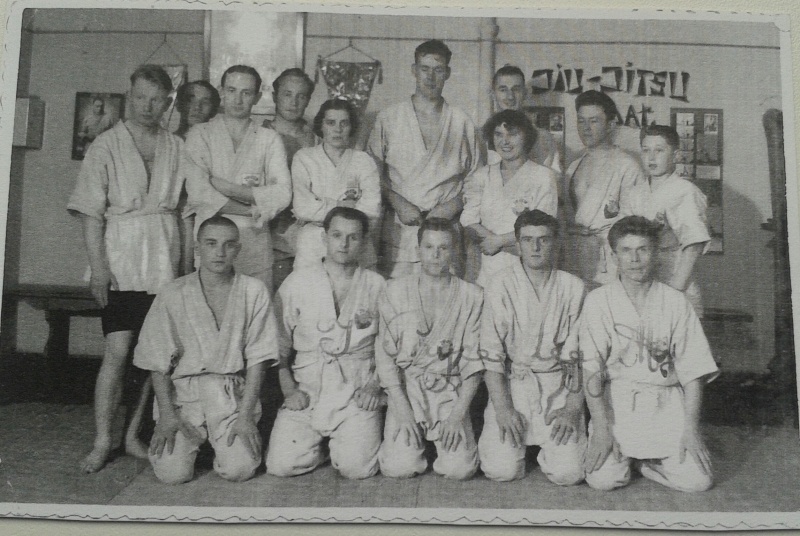 An article entitled "The early days of Judo in Czechoslovak Republic (and the contribution of the London Budokwai)" written by Petr Brezina and edited by Llŷr Jones, has been published in Issue 25 of the Bulletin of the Kano Society. All is from czech rare book Fundamentals of Jiu-jitsu (1936/37) by Stefan Fülöp (S.F. Dobó). I could't get this book in time of writing article. I think that exist only few pieces today. Fascinating and of real historical interest. Jonesy wrote: Fascinating and of real historical interest. 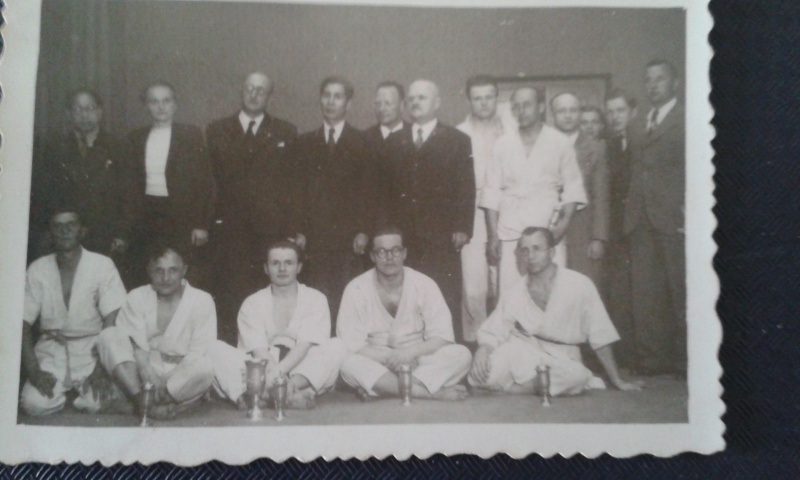 I was able to identify several people in the picture from a visit Jigoro Kano in Prague in 1936 (late August / early September). Prague visited the route of the Olympic Games in Berlin, a lecture and instruction began judo training in the school year 1936-1937 in Section college sport in Prague. 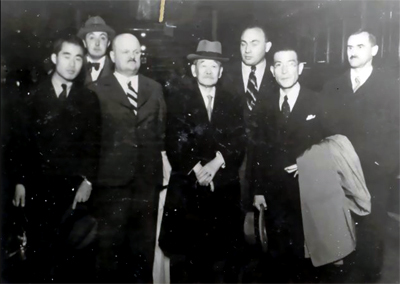 In the photo from left: unknown Japanese man, Dr. Gerolf Coudenhove-Kalergi (Secretary of the Japanese ambassador, his mother was famous Mitsuko Aojama/Coudenhove-Kalergi), František Smotlacha (known mycologist and a director of college sport in Prague), Jigoro Kano, F.S. 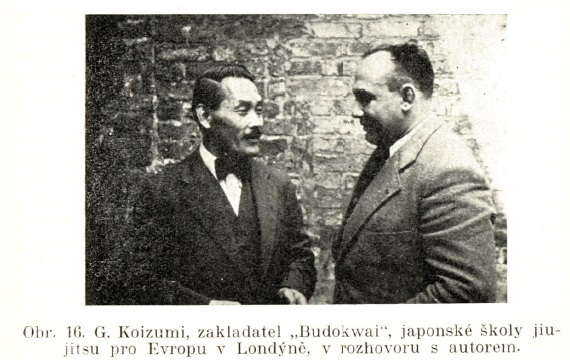 Dobó (lead judoka/jiujitsuka in Czechoslovakia), japanese Charge de Affaires Dr. Noboru Ogawa, an unknown man from the Czech Republic. 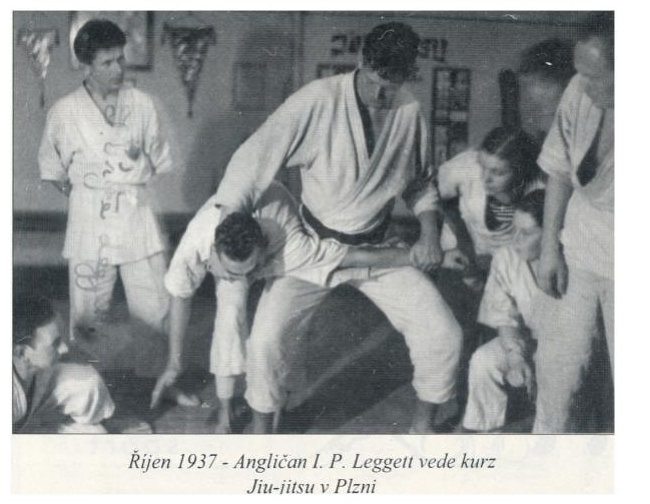 As it seems, there were some "even earlier" days, when, even prior to WWI, the country was still part of the Austro-Hungarien monarchy, and at least one Russian taught "Jiu-Jitsu (Ju-Do)" in Pilsen (Plzeň), for example. Of course, the country neither was called Czechoslovakia, nor Czech Republic back then. thank you a lot for your note. 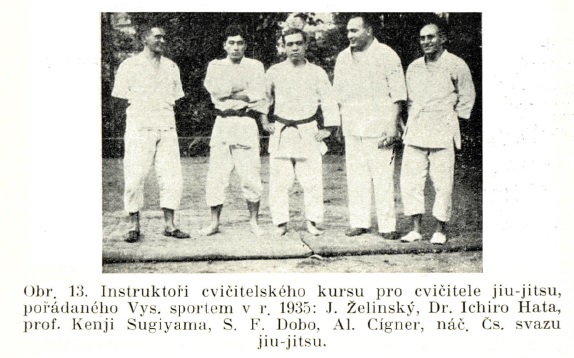 Reinberger wrote: As it seems, there were some "even earlier" days, when, even prior to WWI, the country was still part of the Austro-Hungarien monarchy, and at least one Russian taught "Jiu-Jitsu (Ju-Do)" in Pilsen (Plzeň), for example. Please can you tell me more, it is interesting and czech sources have not these informations ? I have text written in year 1936 from Dr. Frantisek Smotlacha. 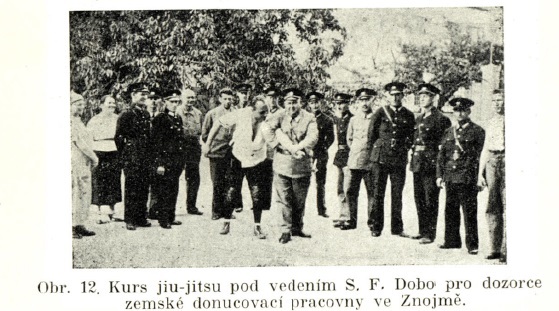 It is about jiujitsu history in Czech Kingdom (part of Austro-Hungarien monarchy to end of WWI) in this time. In year 1907 was created the small group in university sport Prague, they had not any teachers, only leaders (F. Smotlacha, school inspector Mr.Klenka). They had the german release the book from Hancook and Higashi "Das Kano Jiu-Jitsu" (F.Smotlacha buyed it them), some translations of books from A.Cherpillod. Later 1920 they had any books from Mr. Vary. In the year 1925 the new czechoslovak army released book "MNO Sebeobrana" (MNO Selfdefence). The jiujitsu is practiced more in YMCA, private schools, sport clubs, police clubs. The studying was from books only. noboru wrote: Please can you tell me more, it is interesting and czech sources have not these informations? All that may not be very well known in the Česká republika today, as, while the articles appeared in Czech newspapers, it were newspapers in German language, and the German-speaking population and it's history weren't very welcome there, before and after WWI already, but were - without differentiation - even ex-pulsed from the country after the Nazi-dictatorship and WWII. BTW, noboru, the name of one of my grandparents was Vlk. Exactly, you have right. Bad times for Austrians, Czechs people and after WWII for German people in Czechoslovakia too. More sufferings, irreparable damages caused by all sides. :-) the word Vlk is czech word, it means Wolf (der Wolf). It looks like that you have czech roots (may be Sudeten roots). From Pilsen? I am from Budweis It was city with german majority (80%) before WW2. Maria Vlk, née Moravec, born 1864 in Vepříkov, parish Příbram, in Bohemia, daughter of Josef Moravec and Maria Moravec, née Pešek. I looked at the map, and can't understand, how Vepříkov could have belonged to the parish of Příbram, but that's what is stated in an old document from my grandpa (his certificate of baptism, the sole forerunner of birth certificates in Austria). Currently, I'm a little bit in your country from time to time, when we are shopping in Chvalovice-Hatě, or, to be more exact, in Excalibur City. In 2014, together with my family, I went to Břeclav with a steam-powered train, to visit the exposition of "175 years railway in Czechia". That are some short years more, than the history of Jūjutsu/Jūdō there, but both share their history of a "connection" with Austria(-Hungary). The very first (horse-drawn) public railway in continental Europe was a line, connecting your town with an Austrian town: the Railway České Budějovice - Linz. The aforementioned final examination seems to have been successful, as the municipal committee of Znojmo subsequently approved the request No. 3399 for payment of the 300 kronas. They had to be booked to code XII of the municipal estimates. Does anybody know if these Russians were of the same Chinese school that was under Kano's tuteladge and where e.g. Vasili Oshchepkov learnt Judo. I'm just guessing that if there was one Russian then there were more. Another possibility is that these were "self made" jiu-jitsu teachers as very few did learn the true art. But by buying the book and studying the moves you were better than anybody for 10 day course. finarashi wrote: Does anybody know if these Russians were of the same Chinese school that was under Kano's tuteladge and where e.g. 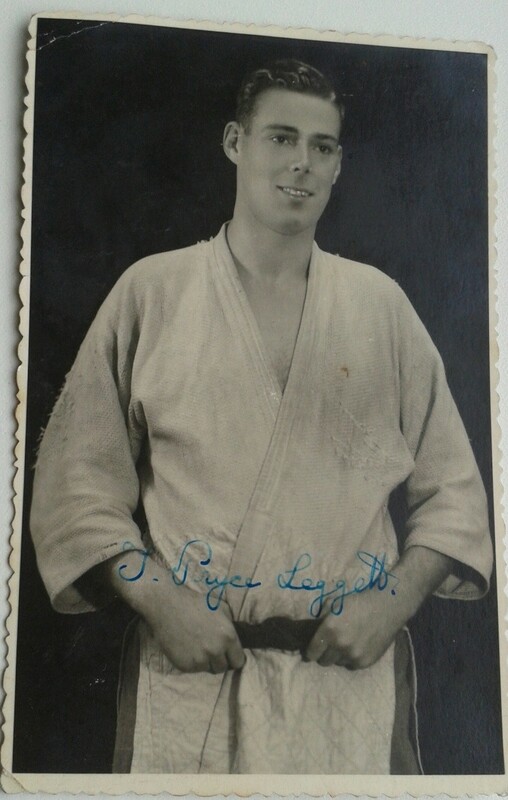 Vasili Oshchepkov learnt Judo. Are you asking if Russians studied at the Kobun Gakuin, the school Kano shihan set up to teach Chinese students? There were foreigners, including Chinese, that attended the Tokyo Higher Normal School, but the school and the curriculum at the Kobun Gakuin was specialized for the Chinese sent by their government. yes, it would be very interesting (but also difficult, I guess) to find out the technical background and origins of those people. Were they legit? But, whatever the case and regardless of their quality, even characters like the ones you alluded to, as well as ten-days-course participants (BTW, I even found mentions of police-courses as short as two days! Perhaps the financial possibilities of the communities in question also played a certain role), and even the people that later tried to learn the art via correspondence courses - they all were phenomena that existed, and therefore have their place in the history of the arts, I think. What I also think, is, that Jūjutsu and Jūdō aren't arts that only are practised by "great grand masters" of flawless origins, histories, knowledge and skills, and weren't such, (not only, but) especially outside Japan, and (not only, but) particularly during those initial phases, were they? I quite agree. The famous father of Scandinavian jiu-jitsu Viking Cronholm AFAIK never seriously studied jiu-jitsu nor judo. His claims of teachings can not be verified. When he left South Africa he has no verified background. I have a book signed by him IMHO on his way back to Sweden (if I remember right in Marseille). When he arrives in Sweden he is a jiu-jitsu expert. Expertize is verified by publishing a book (with number of reprints) and holding courses. The book is "Judo Kyohan". The books by Hancock started circulating around 1905, so after that it was easy to be jiu-jitsu expert. But a bad teacher is better than no teacher at all. The first illustrated text about Jiu-Jitsu by Hancock, I've found so far, is from January 1901. I think the first edition of Spalding's Jiu-Jitsu book with "Poses by A. Minami and K. Koyama" may have been issued the same year. Hancock published his "Japanese physical training" as early as 1903, his "Physical training for Women by Japanese Methods", "Physical Training for Children by Japanese Methods" and "Jiu-Jitsu combat tricks" followed in 1904, the same year, when Capt. Harry H. Skinner released his "Jiu-Jitsu" with Kuwashima demonstrating, and Yae Kichi Yabe his five-part instruction course "The Yabe School of Jiu-Jitsu". Additionally, a huge number of - partially also illustrated - articles had appeared in all kinds of languages, newspapers and magazines, during that years. I guess that he, who had to wait until 1905, and for Hancock's notorious "The Complete Kano Jiu-Jitsu (Jiudo)", issued then, may even have been a little bit late already, to eventually become a "Jiu-Jitsu-expert". IMHO all the way into WWII in Europe one had little to judge whether somebody knew any jiu-jitsu or not. In some countries this was even longer at least into 19070's. "Deutscher Turnverein in Prag (German gymnastics club in Prague). J i u - J i t s u - C o u r s e s. There is an opportunity to learn this reliable technique of self-defence in short courses. The lessons are given by a proven and graduated employee. It's possible to hold courses for ladies and gentlemen. All informations in the office, daily 5-8." Throughout the 1930s Ichige Kozo , the Japanese consul in São Paulo and haiku poet (haigo Gyosetsu), was active in promoting haiku among the Japanese population in Brazil, notably in the haiku study group led by Kimura Keiseki (1867–1938) in São Paulo. Here are some photos of T.P.Leggett. They are from perslonal archive of Mr. Václav Bauer 6.Dan. was member of judo national team Czechoslovakia, a coach assistent of judo national team, coach of junior judo national team Czechoslovakia,coach of judo club Škoda Plzeň. 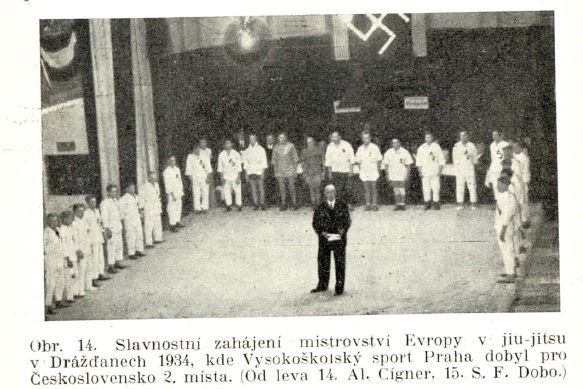 Photo with jiujitsu members of club AC Plzeň from Czechoslovakia, year October 1937. (Plzeň is city in west Czech Republic - in outside could be known as Pilsen - Pilsner Urquel beer). "News from Czechoslovakia. Some days ago, Japanese wrestlers stayed in Prague, and fought a freestyle fight against the wrestling-team of K. A. K. Kral. Vinohrady. The Praguers won with 5:0 points. Then a Dschiudschitsu-Match took place; here, the Japanese were victorious with 3:0 points. ...". It has to be noted, that in the first part of the 20th century Japan tried to gain a foothold in the western wrestling-sport by, among other things, retraining suitable jūdōka. Hello Reinberger, thank you a lot again. In this time were japanese judokas Ichiro Hatta, Kenji Sugiyama and Ms. Sarah Mayer in Prague. They lead some judo trainings with czech judokas and some matches (end of July in Radiopalac). I think that Ichiro Hatta, Kenji Sugiyama were in the european judo tour (Japan, Moskau (Sowiet Union), Prague, London - may be some next cities), Sarah Mayer received shodan in this year in Japan and may be he went to home (England) with Hatta and Sugiyama.